There are no hidden costs, and your POP shelving display performs its own sales. How much easier can it get? 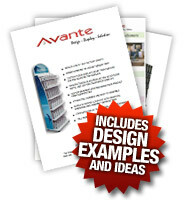 Avante has been focusing on perfecting our display design for almost two decades. It makes no sense to risk your company image with anyone who doesn’t have the ability to grab the sale and deliver the tools to do this day by day, for no additional charges. Quality materials, in-house manufacturing and low per-display charges make it affordable for any company. A POP shelving display will catapult profitability at the point of sale—week after week. Because of our complete in-house manufacturing, design, and delivery we are able to keep production, materials and display design processes at the lowest cost possible. This fact is why we are market leaders. The reality behind our industry leadership is that we employ the most talented design team available today. A result of our focus, decades of experience and breakthroughs in multimedia technologies we choose to promote. Anytime you have one point of contact for design, manufacturing and delivery—you have a savings of time, complexity and hassle. Being given a guarantee of increased sales results means the displays actually pay for themselves so that your return on investment will never be higher. Even our shipping stands out as exceptional for its design safety and simplicity. Flat packing in courier-friendly cartons makes the unpacking and assembly as easy as it should be. Avante will work with you to determine the strongest communication possible for your product or service. We will make certain your design is so bold and impactful that you will inspire store owners to want your display simply because customers respond to their attractiveness. Quality is everything, and our reputation is based both on quality and results. In-house design and development from concept-to-completion is the most cost-effective streamlining that can be achieved. Our in-house manufacturing begins as soon as our design team has completed your concepts. Our art renderings lead to the best-case scenario for streamlining a door to door delivery with no in between steps required. This simplicity of our process is what makes the self-selling POP shelving display the sweetest deal a company could hope for. On-going sales impact at the check out line that continues selling itself with no effort on the part of the business owner is as close to a dream-come-true as retail sales can get. Stores have been known to request our designs when dealing with product sales representatives because of the dependability and striking results of our displays. We integrate the most environmentally-sound approaches to POP shelf displays that can be delivered. Our attention to layering the quality into every aspect of how we design and deliver is the reason our marketing and sales obtain such strong results. Research of he POP display market revealed custom-designed POP shelving displays offer up to 2:1 advantages over more traditionally used materials. When in-store analysis shows that POP shelving displays deliver a 28% sales lift, compared to standard materials at 13%. These statistics are consistent across displays with multiple materials and messages. It doesn’t get easier than choosing concept to completion services with only one low payment for your delivery that guarantees you will enjoy increased sales on a daily basis. This is simply an investment that pays for itself in the fastest possible turn around time. Our teams are winning design awards and keeping Avante at the top of our game for these reasons. All across America we remain the steady number one choice for those who are serious about their retail sales results. Avante POP Displays provide much more than just custom designs, manufacturing and distribution. We work with well-known companies like Dish Network, JVC Electronics, Molson’s Brewery, National Geographic, Maytag/Crosley Appliances, Watkins, Body Glove, LG and many more. Choosing experience means knowing how branding your unit with full side graphics will prevent “display hijacking” and other market challenges. We feature slot-wall, display cases, pegboard, clothing racks, shelving, acrylic displays, modular displays, kiosks and interactive displays. Call 250-497-5110 or 1-877-407-8655 to request a catalog or visit our website to learn more about POP Shelf displays.